Have you ever sat in a hot tub at the end of a really long day and just let the stress and anxiety melt away? Hot tubs are such a wonderful thing to have. I have a favorite place in the mountains that I love to stay in the winter, mostly because it has the most amazing hot tub on the deck. If you have ever wanted to own your own hot tub but you thought that maybe they were just a bit too expensive, I have such a wonderful treat for you. 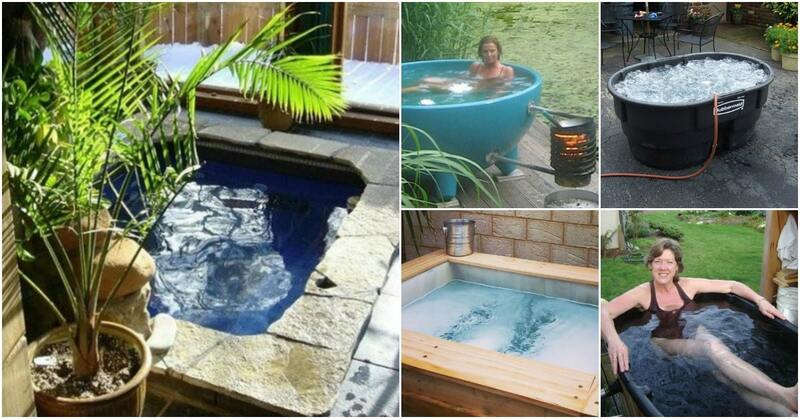 I am going to show you 12 of the most amazing hot tubs that you can DIY! These hot tubs are going to give you such a relaxing place to sit and watch the world go by. Imagine sitting in your very own hot tub and soaking away the stress from a long, tiring week at work. Or, how about inviting over a few of your friends and family and having them join you for a nice soak in the hot tub? If this sounds like something that you need in your life, you are going to love these DIY hot tubs. And, you can really create a relaxing have when you add in one of these 30 DIY fire pits. A hot tub next to a fire pit would just be heaven. So, if you have always wanted your own hot tub, now is your chance. You are going to love how easy some of these are to build and they are all relatively cheap considering the price of buying a hot tub from a manufacturer. There is even one that you can build for less than $100! 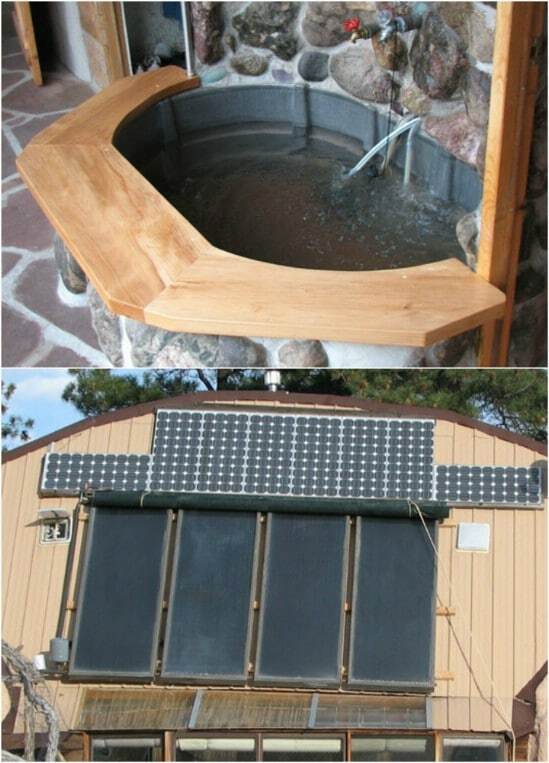 And, there is a beautiful hot tub that is solar powered and has a fountain! Whatever your personal style, you are going to find a DIY hot tub to match it and I hope that you enjoy it. Also, be sure to take a look at this DIY Pinterest inspired backyard transformation. Build the hot tub for you and the rest for the little ones. 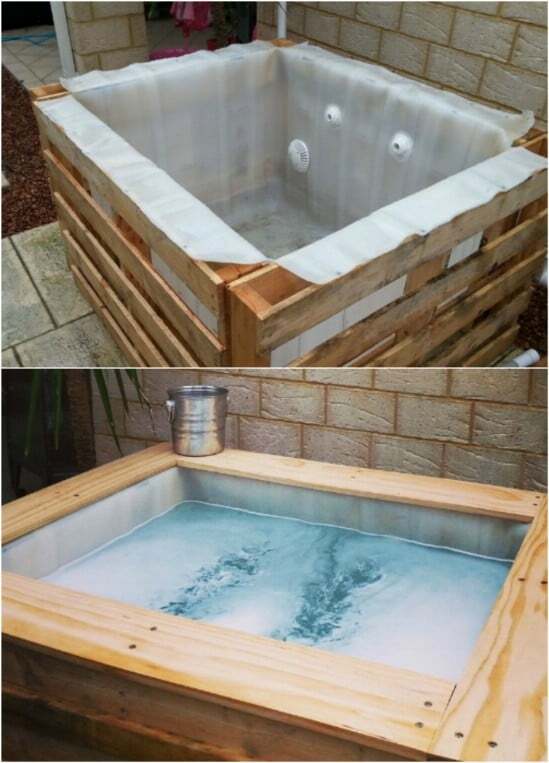 You can upcycle a Rubbermaid container into an easy to build one person hot tub that is perfect for when you want to relax and enjoy some alone time. Actually, you will need a rather large container – a 150 pound one to be exact and you’ll need to add a way to heat your water, but the concept is a really good one. You could even put jets in this and make your own mini jacuzzi. 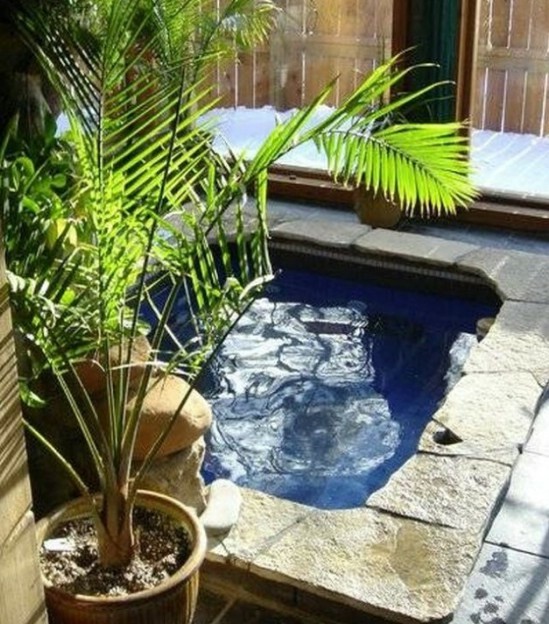 Not only is this hot tub relaxing, it is so gorgeous – and it has a fountain! It is also solar powered so there is no need to worry about how you’re going to heat the water. The sun does all of that for you. The stone background is beautiful and offers such a peaceful atmosphere. This is a pretty complex project, but not at all difficult. You can easily have this finished in a weekend or two and be enjoying your gorgeous solar powered hot tub before you know it. You know those pallets that you have in the backyard that are just waiting for a good project? Well, here it is. This is a hot tub that you can build from those old pallets and it’s got a gorgeous rustic look that is perfect if you are going for DIY farmhouse décor in your backyard. This one is pretty simple to build, too and won’t take you more than a weekend or so to complete. The best part? You can build this for around $100 or so depending on certain materials that you may already have on hand. Imagine the joys of sitting in your own cedar hot tub. Can’t you just feel the relaxation flowing? 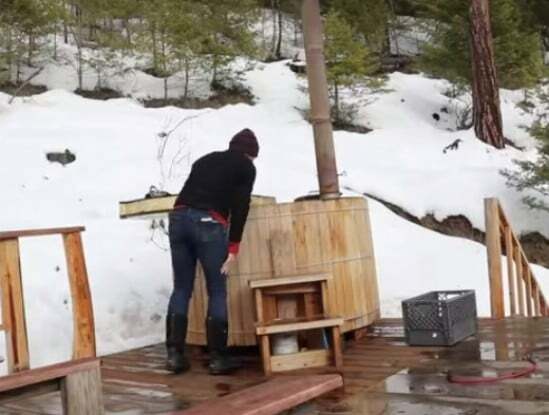 You’ll be able to stop imagining and start experiencing when you build this simple cedar hot tub that is wood fired. Wood keeps the water the perfect temperature and this one is really reminiscent of those gorgeous cedar hot tubs that you see in chateaus and resorts in the mountains. And believe it or not, those cedar boards aren’t going to cost you an arm and a leg. 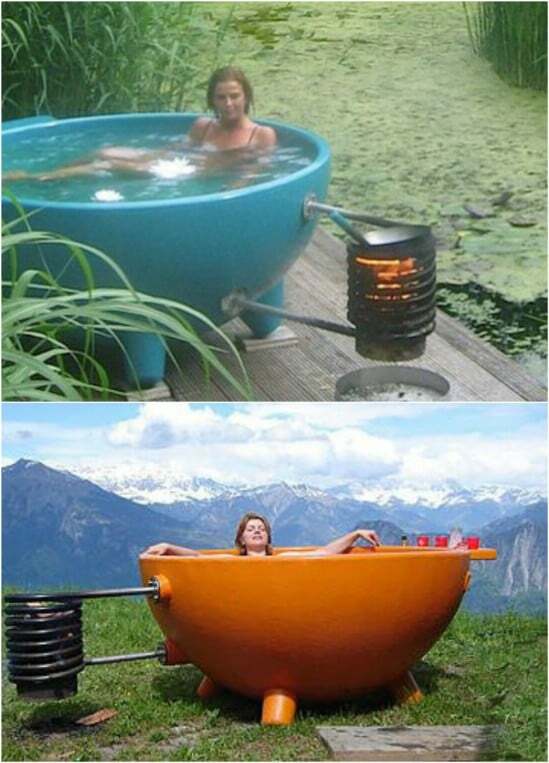 If you have to purchase all of the materials to make this hot tub, you’ll spend around $600 or so. But, this one will easily hold up to 10 people, and you certainly can’t buy a hot tub of that size for less than $1,000. Plus, this one is super easy to make and it is perfect for having all of your friends over for a nice relaxing soak. And, it’s small enough that you can move it on the back of a pickup truck, so it’s somewhat portable if you need to haul it to a more relaxing spot for your gettogether. A hot tub made out of concrete is going to last for quite some time. You should also consider that concrete makes it semi permanent so this is a great idea only if you never plan to leave your hot tub or move it somewhere else. This is a pretty easy one to build, though so you could always just build another. This gives you a really professional looking hot tub that people will swear cost you thousands – only you can do it much cheaper and get the same look and the same relaxing result. This is definitely one of those cool concrete projects you need in your life. 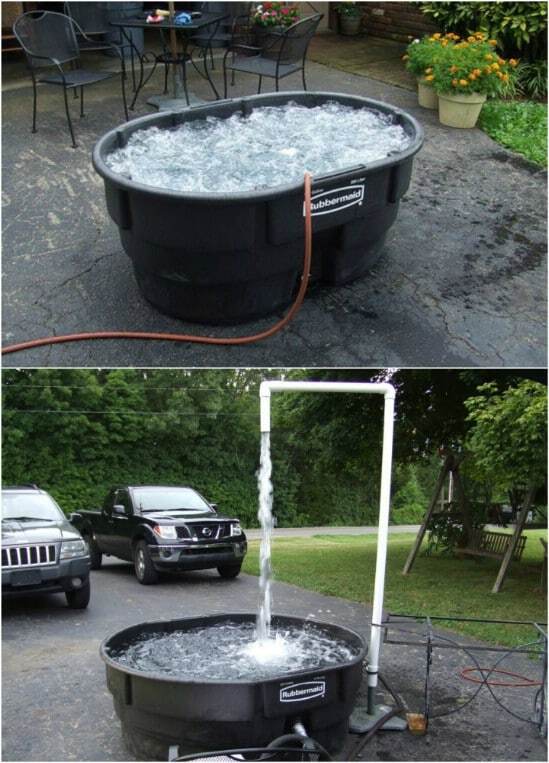 A bathtub is built for holding hot water, so why not turn an old one into your outdoor hot tub? This is a relatively simple project and it’s great if you are working on a budget. If you don’t have an old tub to use, check your local thrift stores or check with local contractors who may be remodeling houses and removing old bathtubs. You can get them pretty cheap and they do make wonderful hot tubs if you only have one or two people who want to soak at the same time. 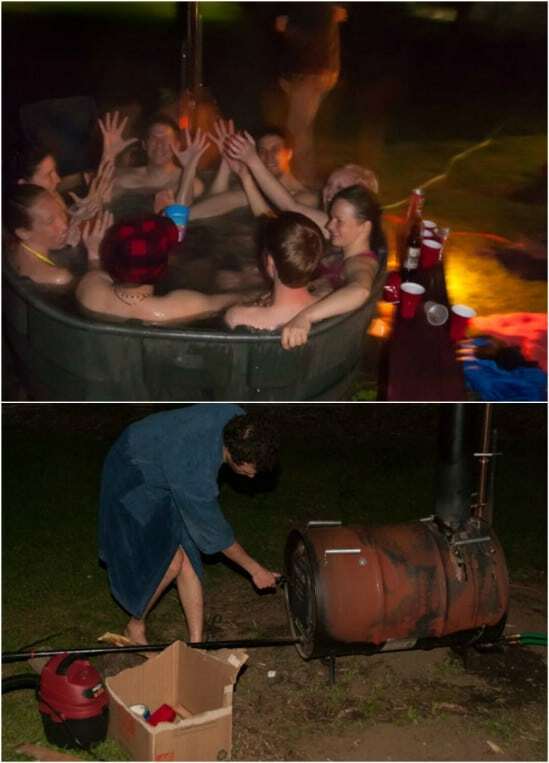 You don’t need electricity to heat the water for your hot tub. This genius design uses a coil that pushes heat into the water and it only takes a couple of hours to heat a tub of over 700 gallons. You can use this with any hot tub design that you build yourself and it doesn’t take much in the way of materials to make it. 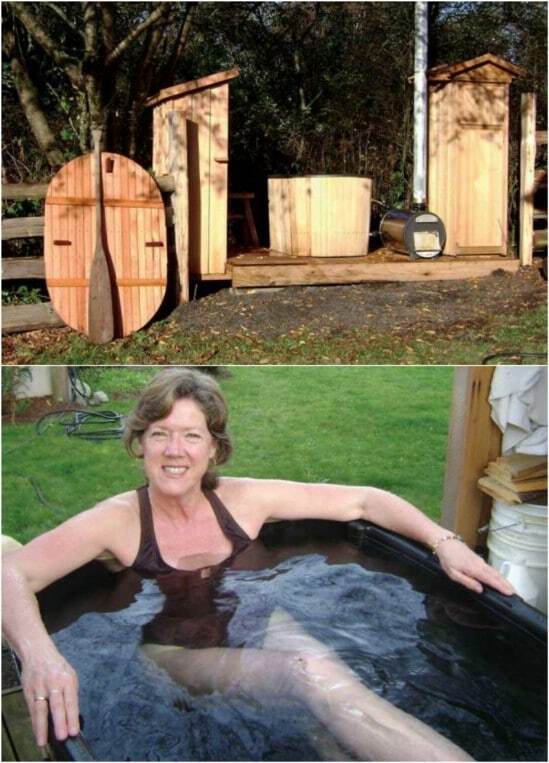 Yes, you can build your own hot tub for less than $75! And, this folk art style tub is great for relaxing with two or three of your favorite people. 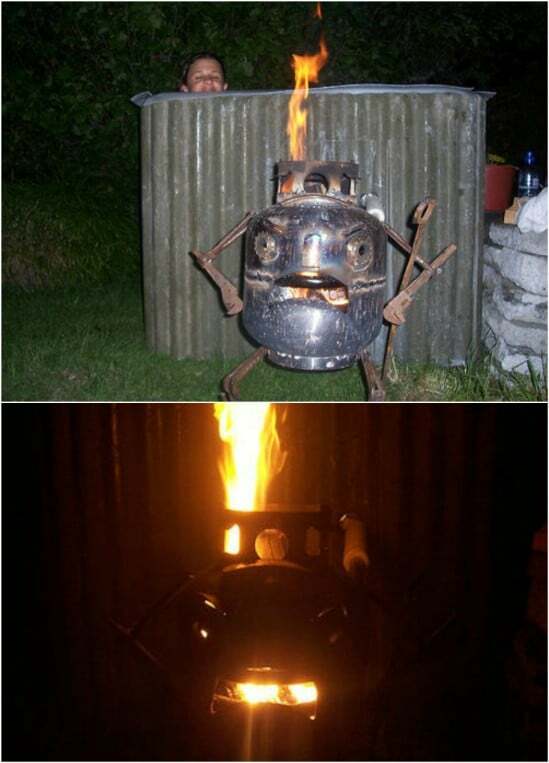 It is built from an old bulk liquid tank, a gas bottle and stainless tube, as well as random junk – don’t worry, you probably have the random junk on hand and if not, you can get it at yard sales or thrift stores really cheap. This one is also pretty easy to build and won’t take you longer than a weekend to finish. This hot tub will set you back about $1,000 to build, but you aren’t building just the hot tub itself. This little backyard oasis comes with a wood fired heater, a storage nook and a shed where you can store the wood for heating your hot tub, as well as the hot tub itself. That’s a lot of building for just $1,000. 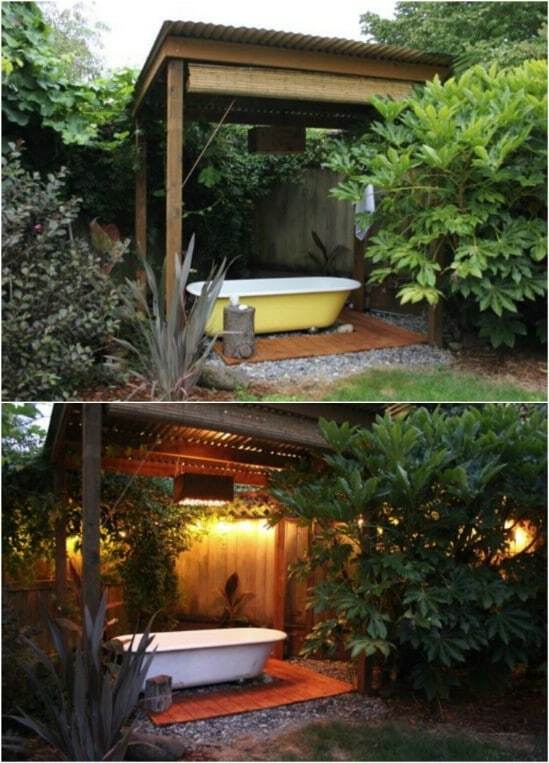 You can dedicate a section of your backyard to your total relaxation and build this little oasis for when you really need to escape the world. And you can add in some DIY backyard furniture to really make it special. If you are really working on a budget, this hot tub, which is solar powered by the way, can be built for just $350. That’s an amazing price for any hot tub, much less one that is powered by the sun. You will save a small fortune not using electricity or having to buy firewood to keep your water hot. Plus, this is a simple build and something that you can definitely have finished in just one weekend. 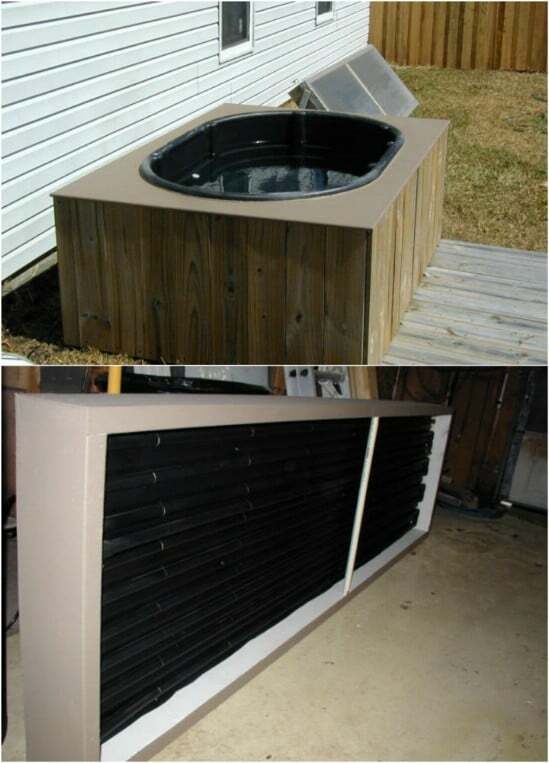 You can build your hot tub to your own specifications, you just have to follow a few basic rules. No matter what materials you choose or what design you have in mind, this is a great way to get that custom hot tub that you have always wanted. These are great at the ends of inground swimming pools or they make wonderful standalone structures as well. Whether you choose stones or thermalite blocks, you will love your custom hot tub that you build just for you. Can you add jets to them if so show me a DYI video on how to build inside my bedroom.